Of a thing I was once unsure about, I now have a better understanding. The inkling came when my mind was drawn, this past week, into a masterpiece of a story. The inkling grew, as the prose grew upon itself, drawing pictures in my mind, of splendour in the grass, and of glory in the flower. The story dealt with the universal themes of idyllic youth–of lazy afternoons underscored by searing first love, pain and obsession,– finely rendered sketches and word paintings of a faded era, of memory and love and friendship. The incandescent images deftly drawn in beautiful prose caused me to look inward, ever backwards, through the layers of years, to my own incandescent youth. It reminds me of the unicorn. 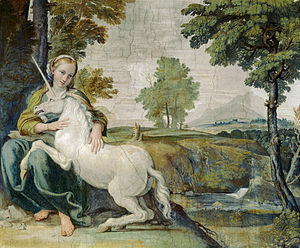 To like and admire a unicorn is a thing of youth. Feminine youth. To a young feminine mind fascinated with the realm of romance (a dreamy, imaginative habit of the mind), nothing stirs the imagination and the heart like the graceful horned mythical creature, for it shares similar qualities of purity and simplicity and in many ways, an ephemeral quality of unattainability, of separation from convention and crowds. Very soon, this solitary symbol of mystery and untameability faded from my consciousness. I grew up. I forgot about the unicorn, this emblem of my youth. Lately though, surrounded by deep ideas and masterful writing, the unicorn has re-entered my life. This is partly because I have befriended an old name, and have discovered that this too, is a unicorn.